The economy of Ladakh has been based on small farms and herding. The economy is a stable and self-reliant rural economy. A small-scale farming system was developed by the Ladakhis. Livestock is also a major part of Ladakh’s economy. Keeping livestock, specially sheep, yak, goats and cows is a major part of pastoral farming. From yak they yield milk for butter, hair for ropes and tents, hide for boots, aprons and baskets, horns for agricultural implements, dung for fuel and meat. The goats have extremely fine, long staple fleece, pashm famed for its end product of pashmina shawls. The Ladakh is a biomass-based economy. Crops like barley, wheat and peas are grown. 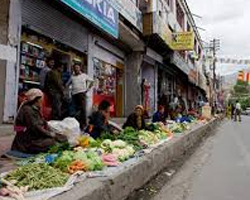 Western agricultural practices like heavy use of chemical pesticides and fertilizer have enhanced the quality of agriculture thereby influencing the economy of Ladakh. Ladakh is an exporter of Pashmina products and dried apricots. In Past, the people of Ladakh used to collect tax on goods that crossed their kingdom from Kashmir, Tibet, Punjab and Turkistan. The tourist sector has developed Ladakh’s economy to a great extent today. People are employed in the tourism industry. Zanskari ponies are distinguished for their strength, speed and stamina and so they make excellent means of transport.